This is a year of new beginnings for me. In February, I published the first three novellas in the Sheikhs of the Golden Triangle series. March is the month I’m blogging for the first time ever. Thanks for inviting me, Delilah! Have you ever wondered about the timing of events? Looking back at the crossroads in your past, have you ever wondered how different your life might be if you’d taken the other road? Sometimes life feels orchestrated, other times totally random. Is there any such thing as coincidence? Life is like story creation for a work of fiction, and we are characters in our own novels. Writing The Sheikh’s Spy made me reflect on the sequence of how things unfold in our lives. For example, Olympia is kidnapped by a wealthy sheikh and held as collateral because her brother can’t pay his astronomical gambling debt. One evening she is called from the harem quarters to entertain visiting dignitaries, and overhears a plot to kill Sheikh Adnan in the neighboring kingdom of Zahiria. She breaks free, intent on warning him that his life is in danger. Get Your Copy | Read Chapter One. If Olympia’s brother hadn’t gambled in that casino on the Riviera the same night the nefarious Sheikh Mahjub was there… or if the sheikh hadn’t decided impulsively to take Olympia as his chattel until the debt was paid… or if Olympia hadn’t decided to escape and find her way to Zahiria… Adnan may have lost his life. Did his survival truly rest on a series of ‘what if’ events, or would he have been spared in some other way? Then I reflected on a few major events in my own life. If my parents hadn’t taken me to a particular night club on my twenty-first birthday, I wouldn’t have met the man who became my first husband. When he asked for my phone number, I hesitated and wanted to fake a number, but something compelled me to give him my phone number. In the series prequel, The Amulet, what if the Prince of Zahiria hadn’t fallen in love with the witch’s daughter? If he’d married the princess his parents had chosen for him, perhaps a long series of misfortunes and wars could have been averted. Oonagh the witch may never have created an amulet to protect his kingdom, and the intrigues that plagued the region for centuries may never have happened. I like to think we have some control over our lives, but sometimes in hindsight it seems life’s pivotal moments came about like the toss of a coin, or the spin of the wheel at a roulette table. Maybe we are all characters in a gigantic work of fiction some cosmic being out there is writing. I find such thoughts fascinating. When we make everyday decisions, it doesn’t feel like we’re taking a gamble, at least not most of the time. Does it all end at death, or does the saga continue on the other side of the veil? In Christmas Spirits, the ghost of Anna O’Cleary agrees to give up her right to visit her old Irish castle ever again in exchange for a weekend with her beloved husband, Sheikh Khazan, in the flesh again one last time. 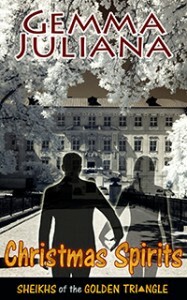 Her goal is to entice him to follow her to the spirit world when she leaves. This was such a major gamble, she probably considered the ‘what ifs’ before she sealed the deal. The universe always fills a void. If I hadn’t met my first husband in that nightclub on my twenty-first birthday, maybe I’d have bumped into him poolside, or in a restaurant the next day. Or maybe I’d have met and married an entirely different man instead. The two things we do seem to have control over are our minds and hearts. We magnetize people, places and things to ourselves based on the thoughts we put out, and the intentions we hold in our hearts. So, are we the ones writing our own novel? Thanks for reading this post and pondering the “what ifs” with me. If you have any thoughts about this, or crossroad experiences to share, I’d love to hear them. If you enjoy sizzling desert princes and passionate heroines in exotic settings, check out my website. Delilah, thanks again for having me! Follow me as my writing journey unfolds ~~ I love hearing from readers and making new friends in the world of book lovers!